Umbra takes its name from the darkest part of a shadow. 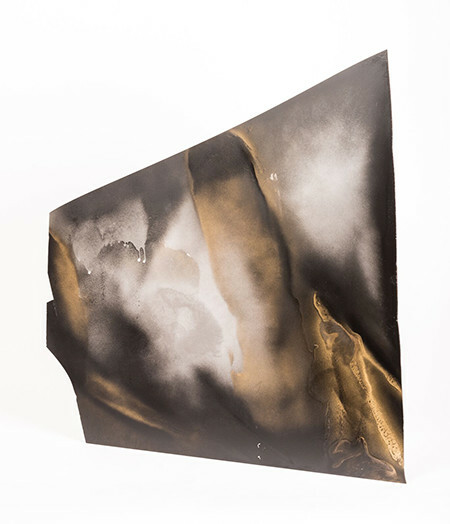 Churning surfaces are created on acrylic sheets using spray paint, paper and epoxy resin. Cybulka works instinctively, the final image forming under his fingers, guided by the materials themselves. The resulting shapes are formed organically, with deep, moving surfaces of cloud-like swirls, mirroring our interior thoughts. Drawn to the work of psychoanalyst, Carl Jung, Cybulka explores the shadow of the self, the parts we keep hidden but bubble away beneath our surface. Thoughts that linger, working away at us until they are barely contained. In his studio, Cybulka worries away at the materials. His sculptures are formed through a repeated process of papering, spray painting and tearing, working towards achieving a balance in the composition. Known for working on a monumental scale, Umbra is by contrast a grouping of smaller doubts, worries that gently whisper constantly throughout our lifetime. The work solidifies the voice in our head that criticises and cannot be quieted. 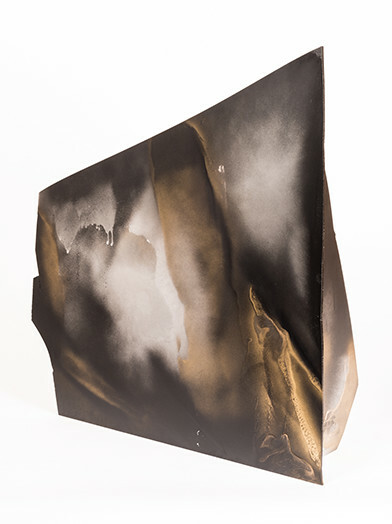 Based in Adelaide, South Australia, artist Steven Cybulka works in sculpture and installation, utilising a range of materials including resin, acrylic, paint, timber, concrete and glass. The resulting objects are abstract in form, architectural interventions that strike a balance between chaos and order. 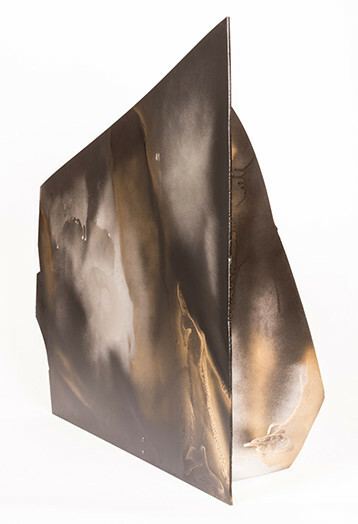 In 2013 he completed his Bachelor of Visual Arts at Adelaide College of the Arts and in 2016 received his Honours degree (First Class) at the South Australia School of Art, Architecture and Design at the University of South Australia and in 2013 he won the Arts Excellence Award (Sculpture) from the Adelaide College of the Arts. In 2014 he was the inaugural Adelaide Festival Centre/SALA Artist in Residence at the Adelaide Festival Centre. In 2016 Steven was commissioned to create a large scale site responsive sculpture to act as the framework for the prestigious Primavera: Young Australian Artists exhibition at the Museum of Contemporary Art, Sydney, and in December of the same year presented his first interstate solo exhibition Searching Shadows at Interlude Gallery, Sydney. Steven is currently developing commissions for SA Power Networks, Adelaide, and Sound Passage, in collaboration between the South Australian Government and the West Java Government in Bandung, Indonesia.